Q. We have a bet at our office on how you pronounce the name of your Vetro clock. Is it “Vee-tro” or “Vet-ro”? A. It’s “Vet-ro,” but the clock won’t mind if you call it “Vee-tro.” “Vetro” means “glass” in Italian, and we chose it because it signifies the clock’s sleek black touchscreen (and sounds cool). Q. At the bottom of my TimePilot Central screen it says “Transactions need to be extracted!” What does that mean and how do I do it? A. That message is telling you that transactions—the individual clock-ins and clock-outs by your employees—are building up in your database. When your pay period ends, we strongly recommend that you “extract” your transactions; in other words, that you remove them from Current Transactions and put them into a separate file. This May 2012 article will give you all the info you need. Q. We have TimePilot Extreme, and we've noticed that our iButton Receptor only works with the computer the program was first loaded onto. How can I get it to function on another computer as well? If the first PC were to go down, I don't want to be unable to assign iButtons to new employees. Method 1: If your TimePilot software CD is handy, insert it into the second computer's CD drive. When the installation screen appears, click "Install TimePilot Software." On the next screen, click "TimePilot Installation Menu," and on the screen that follows, click "Blue Dot Receptor" and follow the instructions that appear. Method 2: On the second computer, go to the TimePilot web site's Downloads page and follow the instructions to download and install the Blue Dot Receptor driver. Maybe time travelers can't figure out Facebook: A team of scientists at Michigan Technological University has conducted a semi-whimsical search for evidence of time travelers, and, unfortunately, didn’t find any. Their theory was that important events that would be known far in the future might be mentioned by accident by time travelers visiting the past before the events occurred. Their internet search for such references turned up nothing. For instance, they looked for references to “Pope Francis” before March 2013, because Pope Francis, who was elected then, is the first Pope to have chosen that name. TimePilot Q&A: Vetro? Veetro? ; extract those transactions. Lead story: More "off-the-wall" ways to use TimePilot. 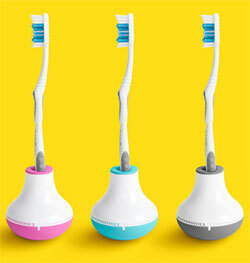 Cool Stuff: Bobble Brush Timer. The Deal: $40 off 1-Year Support Agreement. This month's special deal is one year of phone or email support for $89—that's more than 30% off our regular price!